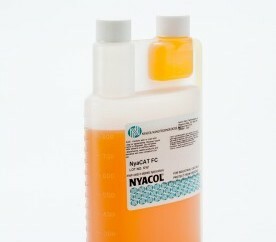 NYACOL® offers colloidal cerium oxide in the form of colloidal sols and nano-structured powders. 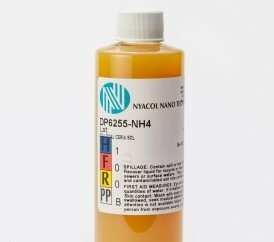 Ceria acetate and ceria nitrate are dispersions of 15-20 nm dispersions of CeO2 stabilized by acetate or nitrate respectively. The particles are hydrous materials and contain a fair amount of bound water until dried. 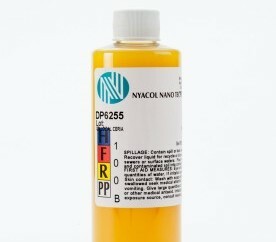 DP6255 and DP6255-NH4 are charge reversed versions of ceria acetate. These are negatively charged sols with either potassium or ammonia as the pH controlling additive. CDP is ceria dispersible powder. The spray dried ceria spontaneously exfoliates in DI back to a sol with minimal mixing. 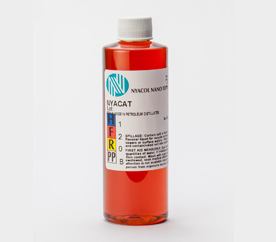 NyaCat is a dispersion of 20 nm ceria in Isopar L. The product can be used in coatings or as a diesel fuel additive or as an FCC additive in the oil refinery. Ce80/10 is a next generation cerium oxide which can be used as an abrasive for STI and ILD CMP processes, and for precision polishing of glass and quartz. The particle in Ce80/10 is well crystallized CeO2 of 15 – 20 nm. For use as an abrasive for STI and ILD CMP processes and for precision polishing of glass, quartz, displays and glass hard disks. For use in precision polishing of glass and quartz; abrasive for STI and ILD CMP processes; additive in environmental catalysts. Designed for use in automotive and other catalyst production, as a zirconium stabilizer in ceramic applications, and in glass polishing and coating applications. Inorganic UV absorber. 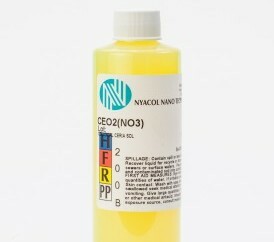 For applications where the formulation requires an alkaline system and ammonia or amine is undesirable. 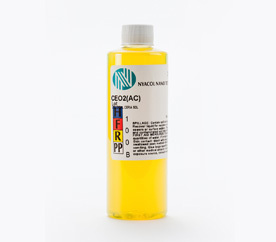 Excellent UV absorption with high visible transparency. 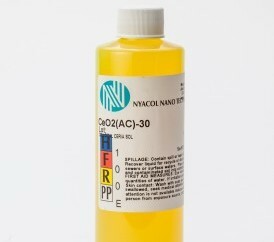 For applications where the formulation requires an alkaline system and sodium or potassium is undesirable. Excellent UV absorption with high visible transparency. Diesel fuel catalyst and combustion catalyst.